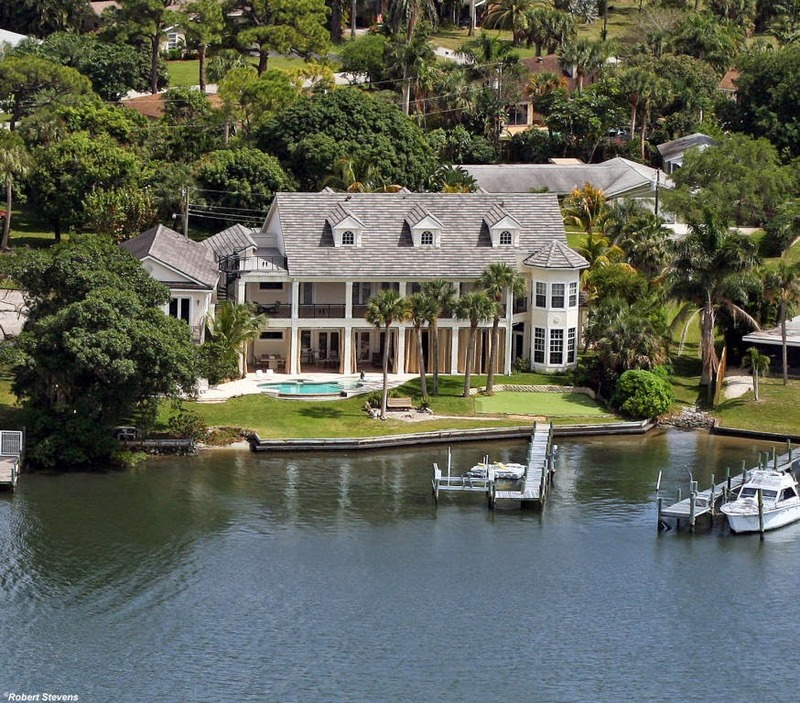 Overlooking spectacular, wide water views of the Loxahatchee River within the highly desirable community of Palm Point in Jupiter, Florida is this extraordinary 6BR/7.5BA riverfront estate. Arranged on three levels, all of which are accessible by elevator, this graciously appointed Palm Point Jupiter masterpiece encompasses a total of 7,903 square feet of meticulously designed living space. The gourmet eat-in kitchen is a chef's delight with its granite countertops, rich wood cabinetry and full suite of top-of-the-line appliances. An expansive family room offers the perfect place for entertaining with jaw-dropping views of the river and a full custom-built bar. Luxurious appointments and custom finishes grace every inch of this plantation style gem including a soaring cathedral ceilings, floating staircase, marble and wood flooring. Outdoor amenities are equally impressive and include a heated infinity edge pool and spa, boat lift, floating Jet Ski lift, private putting green and and a 200 square foot third floor observation deck. Additional luxuries featured in this home include a 2-car garage, separate garage/workroom offering garage space for additional vehicles including an RV or boat, library with custom built-ins, billiard area, third floor storage area, spacious master suite with his and her baths and a private cul-de-sac location. 9 Palm Point Drive is located in Jupiter and is currently asking $3,695,000. This Palm Point listing is courtesy of Premier Properties Of South Fl MLS# RX-10105071 . Nestled on the shores of the Loxahatchee River, Palm Point is a remarkable waterfront community located in the seaside town of Jupiter Florida. Ideally situated within close proximity to I-95 and Florida's Turnpike, Palm Point residents also enjoy an enviable location just minutes to"A" rated schools and a number of local hots spots including miles of pristine beaches and Jupiter's new waterfront destination Harbourside Place. A highly-desirable location coupled with breathtaking views make Palm Point the perfect community for those seeking unparalleled,waterfront living.